Your favorite TV show is about to start but homework is not finished. Too bad you promised mom to not leave your room until homework is done! You have a very long assignment about verbs. It looks like it will take ages to finish it. It’s hard to decide what the spelling of the Past Tense of ‘meet’ is. Or, sometimes you forget to add –s after the verb when you talk about third parties. You want so badly to finish this assignment and start watching the show! But, just like your favorite characters, you crossed your heart and promised to never leave a mission unfinished. Two young astronauts, Max and his sister, Jane, are learning to fly a spaceship through a cloud of asteroids and meteorites. This is a tough job! Spaceship pilots must know many maneuvers and be able to act quickly in no time. Their mentor, Derzelis, is drawing attention to the parts of speech that define action, namely the VERB! 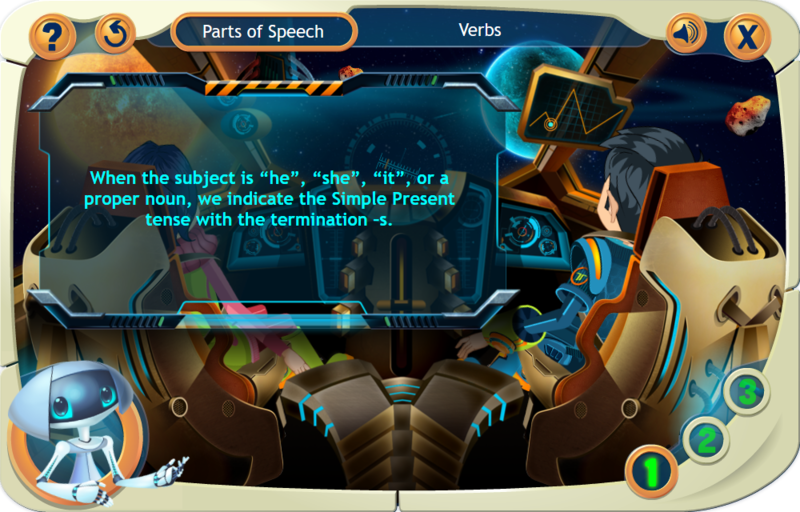 Therefore, during their practice time, in addition to flying maneuvers, Max and Jane will brush up their basic grammar skills related to verbs. Your new friends, Max and Jane are ready for action! What about you? Are you ready to join Max and Jane in this spatial adventure? 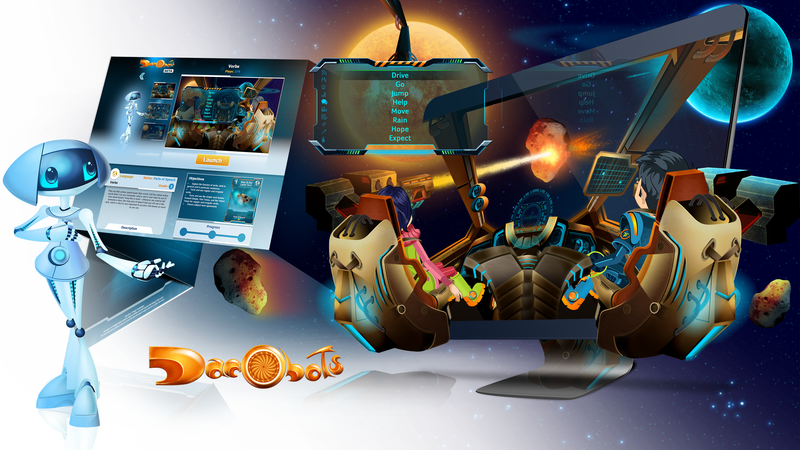 Check out the eLearning games on the Dacobots educational portal and start flying through the Asteroid Belt! Firstly, Derzelis introduces you to the use and formation of simple verb tenses, namely Present Simple, Past Tense and Future Tense, for both regular and irregular verbs. For a better coordination on Earth, as well as in outer space, your team has become very well acquainted with the subject-verb agreement. Therefore, during the second section of the game, Derzelis drills you with sentences with infinite verbs. 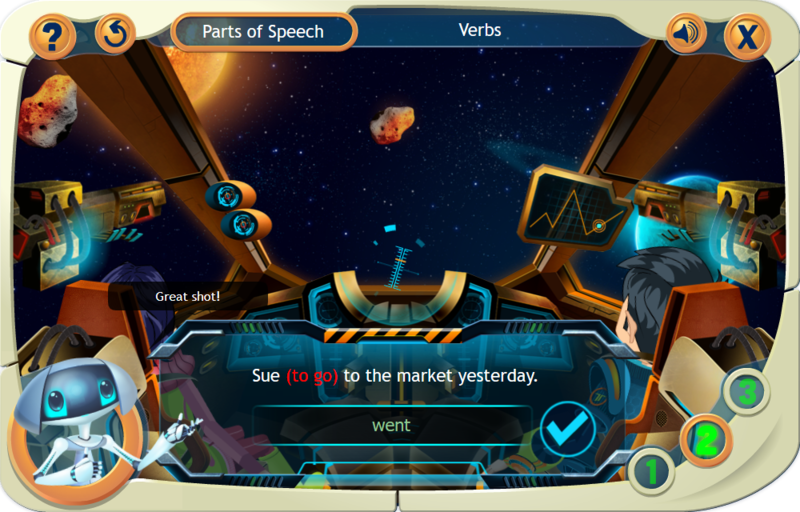 You and your teammates, Max and Jane, have to write the correct tense of the Infinitive verb to finish the sentence. Only if you’re right does the big laser gun shoot and destroy an asteroid within the asteroid belt in order to avoid collision. How cool is that!? Next, Derzelis, who wants you to become as skillful as possible, prepares a double challenge for you. 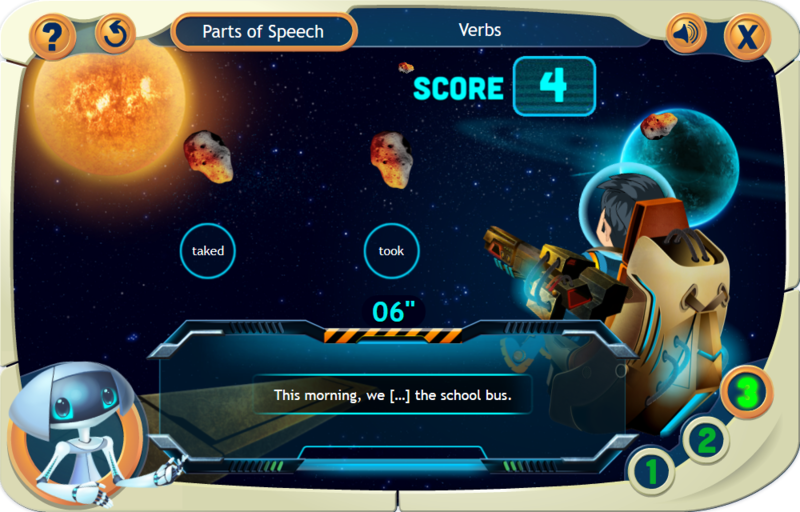 By the time you reach the third section of the game, you will have discovered that some verbs are irregular. To safely pass through the cloud of debris, the spaceship has to avoid the meteorites (small asteroid fragments traveling at very high speeds). Each meteorite coming towards the ship is marked with a Past Tense verb; some of them are correct, some aren’t. It’s up to you to identify which meteorite carries the correct Past Tense form. The fearless Max decided to shoot meteorites from the hood of the spaceship with his portable laser gun. Can you help Max hunt some meteorites? This is no easy task, because meteorites are very fast; you have only 10 seconds to aim and shoot. Careful, at this stage of your flight practice, you can afford no mistakes. Finally, thanks to your participation in this combined exercise of grammar and spaceship piloting, you can earn a card with Max and his portable laser gun on it. From now on, you’re ready for action!